RMA Armament has just introduced their newest Level III+ rifle-graded ballistic plates, the Model 1090. These new ballistic plates are made from highly resistant but lighter weight polyethylene, and come in a single curve configuration. The use of rifle-grade ballistic plates used to be reserved for military units, and specialized tactical teams (SWAT) for law enforcement. However, in recent decades the advent of high-profile mass killings and police response to active shooter or spree killer incidents has revealed the need for police officers to have rifle-grade ballistic protection available even at the patrol officer level. Though a relative newcomer to the ballistic armor market, RMA has made a very positive impact on those in need of ballistic protection. Making their ballistic plates to the highest NIJ specifications, RMA Armament has quickly gained the reputation for high quality ballistic plates suitable for SWAT or Patrol officer use. In particular, the use of polyethylene (UHMWP) has been a vital improvement in the overall portability of heavy armor plates, and RMA Armament has mastered its use in armor plates providing excellent protection, while helping to reduce overall weight. BlueSheepdog has had the opportunity to examine RMA ballistic plates at SHOT Show several times. The quality of construction is top-notch, and staff extremely friendly and helpful, and the tests products clearly indicate a superior product capable of protecting as advertised. Another benefit of using polyethylene is the user gains a bit of bouyancy, where heavy ceramic or steel plates will only add to the weight dragging an officer under the surface should they find themselves in water. The BulletSafe ARAK provides NIJ Level III ballistic protection photo by BulletSafe). 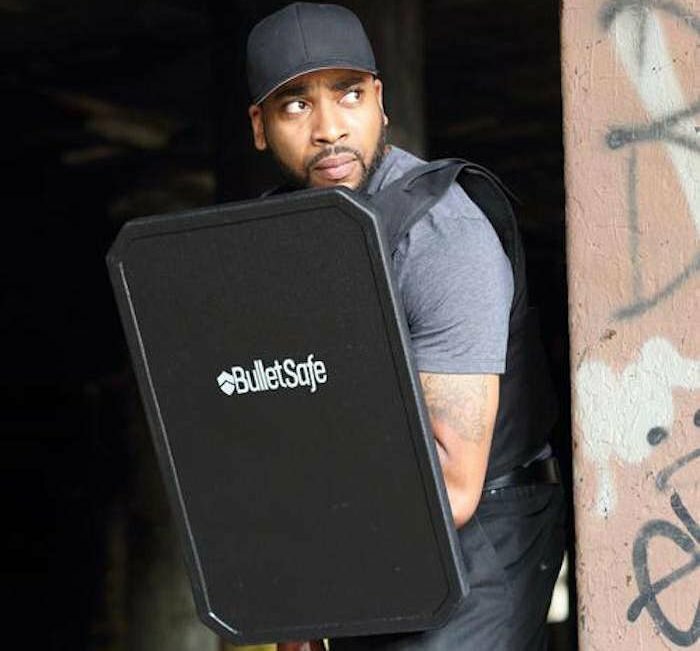 BulletSafe has just released their ARAK ballistic shield for law enforcement and other individuals interested in protection from common AR-15 and AK-47 rifle rounds. The new ARAK (“AR” 15, and “AK” 47) ballistic shield is designed to provide Level III ballistic protection while remaining lightweight, and very affordable. NIJ Level III ballistic protection requires vests, armor plates, or shields to protect the user from lead core 5.56mm, and 7.62mm rifle rounds. This includes cartridges from the extremely popular AR-15, and AK-47 style rifles, but also includes .308 lead core rifle rounds as well. For protection against steel core (armor piercing) rounds, the user would need to upgrade to Level IV. The desire to provide inexpensive ballistic armor protection is one of the founding principles and motivations behind CEO Tom Nardone’s entrance into the ballistic armor field. Nardone helped develop bullet proof fuel tank liners for a Defense helicopter provider using Ultra High Molecular Weight Polyethylene (UHMWP). The polyethylene that could provide just as good protection as Kevlar, but at a much lower price. When soft body armor vests continued to stay high in price using Kevlar, Nardone decided to start his own company and offer protection at prices often half as much as competitors. RISE soft armor provides comfort and advanced securement, with upgraded concealable rifle protection. Angel Armor, LLC (“Angel Armor”) introduced their personal protection RISE™ body armor system at the 2016 SHOT Show. 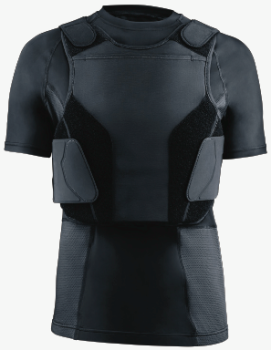 The RISE armor system enables officers to elevate their soft body armor protection with the tiered Truth SNAP™ Plate System. This is very unique for soft body armor carriers as opposed to dedicated plate carriers. We were able to get up close to the RISE armor system, and its innovative up-armor rifle plate armor at SHOT Show, and from what we saw the entire system is very impressive. 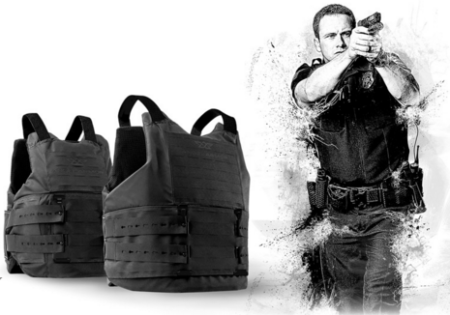 The RISE soft body armor carrier appears comfortable and more secure than traditional Velcro strapped carriers. The Truth SNAP armor plates are more than just simple plates, using an innovative magnet system for desired ballistic protection. Previously we posted on Angel Armor’s ballistic vehicle door armor. Covered 6 is a new ballistic armor provider. One of the most innovative items I saw at SHOT Show this year was the Covered 6 Savior Multi-Threat Shield (MTS). At the time the Savior MTS ballistic shield was a prototype with some final manufacturing details yet to be completed. Now the Covered 6 Savior MTS is finished and ready for purchase. The Covered 6 Savior MTS is a highly compact ballistic shield consisting of Level IIIA Kevlar with a pocket to store an armored rifle-grade plate, and another pocket to discretely carry a pistol, TASER, or other needed items. The new Safariland HyperX System. At the 2016 SHOT Show The Safariland Group juggernaut continued its impressive roll with an amazing announcement of the new HyperX System of ballistic armor. For the first time, a major ballistic armor manufacturer has incorporated the finest features of body armor with the much-needed under shirt. The HyperX System is a game changer, and will likely set a trend among all other ballistic armor manufacturers. Safariland is perhaps the most prolific law enforcement equipment provider in America, and they just keep producing excellent products to make our jobs easier and more comfortable. From the early beginnings making a custom holster in a garage, to the industry leader known worldwide for some of the most innovative law enforcement products, Safariland is the gold standard for just about everything an officer will take onto the streets. Revision announced a new protective lens that is designed to protect officers from lasers in addition to providing ballistic protection. The new LazrBloc GF-8 Laser Protective Ballistic Lens blocks 99.9% of green laser energy and more than 99% of the most powerful near-infrared component of commercial green lasers. 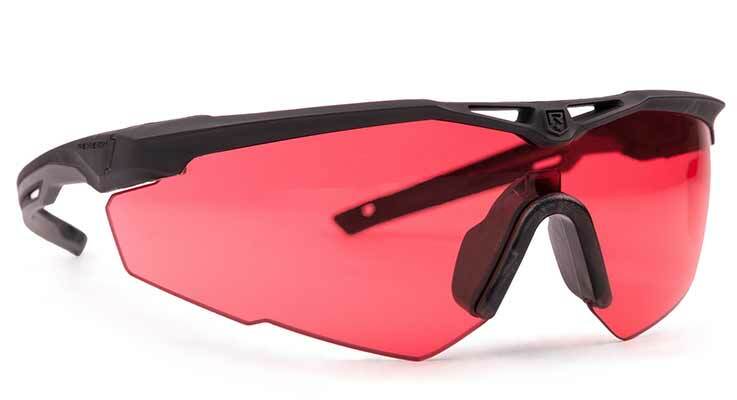 The protective component is a dye that can be added to the ballistic lenses the company makes. Safariland Body Armor – Lightest, Thinnest Ever? Safariland announced an agreement with Hardwire LLC to bring very light, thin body armor panels to the market. Safariland states the new soft armor is 15% lighter than any other armor currently on the market. The new armor uses Dyneema fibers, which have become very popular with many soft body armor companies. It would appear that Hardwire developed a process to increase the effectiveness of the material so that it does a better job at dissipating the energy of a bullet when it strikes the panel. AR500 is offering lightweight ballistic armor plates at an incredibly affordable price. The AR500 lightweight armor weighs just 5.5 pounds while having a profile of only 0.21 inches. The AR500 lightweight ballistic plates are some of the lightest and thinnest steel plates on the market today. When AR500 entered the market just a few years ago they immediately gained attention by providing outstanding armor plates for well under half the price of most competitors. The company has expanded its product offerings to include soft body armor, armor and plate carrier combinations, and advanced armor plates as well. Whether you are going into harm’s way, or training with rifles, the need for ballistic plates is a must. The AR500 lightweight plates are some of the best. Angel Armor of Ft. Collins, Colorado calls itself “a small beginnings company”, but what they are introducing and promoting to the law enforcement community is huge. Angel Armor isn’t the typical ballistic armor company making personal ballistic armor. Instead, Angel Armor makes specialized ballistic armor for vehicles, walls, packs, and other unique needs. Angel Armor provides advanced ballistic solutions for today’s most common police patrol vehicles. With innovative manufacturing processes and techniques, Angel Armor has four patents pending on their products. Angel Armor ballistic products are only made in the U.S.A., and options range from soft to hard, and concealed to structural. Survival Armor is a relative newcomer to the ballistic vest arena, but they bring industry experts with over 75 years of experience. One of the Survival Armor products that has grabbed my attention is their Modular Rifle Plate Carrier. American law enforcement are responding to threats from mass casualty incidents, such as Active Shooter Events (ASE), or terrorist actions. In these critical incident responses, the soft body armor meant to defeat pistol and shotgun rounds are just not enough protection. The Survival Armor Modular Rifle Plate Carrier is a perfect means of up-armoring patrol officers or detectives, allowing them to carry out their first responder duties with more confidence and protection.